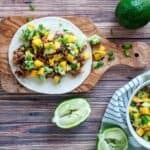 Some delicious BBQ Jackfruit Tacos with Mango Salsa to health up your dinner and to keep great flavors on the menu! Add all salsa ingredients to bowl and mix. Put in refrigerator until tacos are ready.